1. Bring a pan of water to the boil and cook the noodles following pack instructions. Drain and rince under cold, water to stop them sticking. 2. Mix the sesame oil with the olive oil, and heat half in a wok until hot. 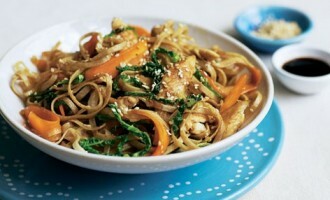 Stir-fry the chicken for 3-4 minutes until golden. Remove from the pan and set aside. 3. Heat the remaining oil in a pan until hot. Stir-fry the onion, carrots, garlic and cabbage for 2 minutes, add 2 tablespoons water and stir-fry for another 3-4 minutes. Stir in the soy sauce, drained noodles and par-cooked chicken, and cook for another few minutes until cooked though, with no pink showing. Scatter with the sesame seeds before serving.